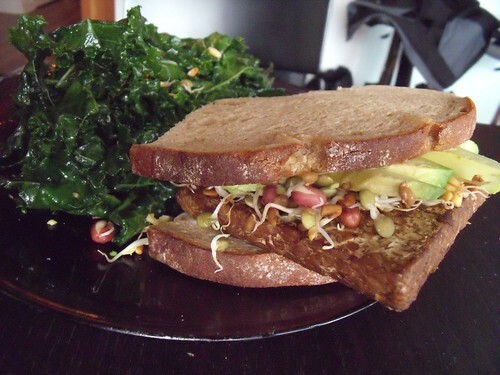 Sometimes you need a sandwich, and sometimes you’re craving tempeh and avocado. If you don’t know tempeh, it’s a fermented soybean product (doesn’t that sound delicious? I promise you, it’s great! ), which originated in Indonesia, and tastes great in curries. It’s on the richly umami side of veggie proteins, with a bit of a mushroom-y taste. This was a quick and easy dinner, with marinated tempeh from the local health food store, a bunch of lentil sprouts, and an avocado that needed to be eaten. Perfection! I had rye bread on hand, but I think this would be divine on a good seedy multigrain. Mmmm. And of course, I needed a new massaged kale salad. The original (lemony) recipe is a definite hit around here, but I wanted to try something new, and so made a dressing out of olive oil, apple cider vinegar, maple syrup, mustard, and jalapeno flakes. Ohhh, it was lovely. You know you want to try it. 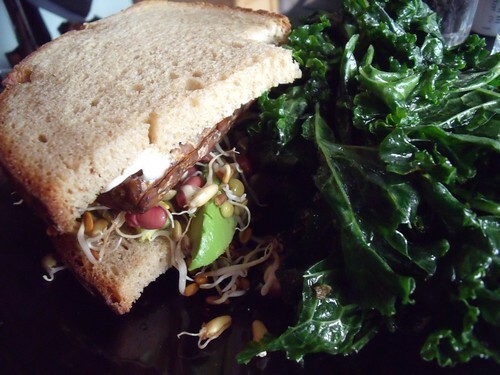 The boyfriend was raving about it, and I agree – this is a great new-to-us way to have kale! Just a little bit sweet, and oh-so-delicious but virtuous at the same time. In fact, this may even be a way to serve kale to kale-haters… just sayin’. Toast two slices of bread. While the bread is toasting, heat tempeh in a grill or saute pan over medium-high heat for 3-5 minutes on each side, until heated through. 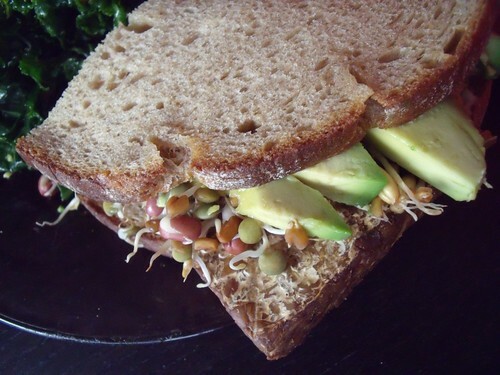 Place avocado slices on one slice of bread, top with sprouts, cooked tempeh, and salt & pepper. If using mayo, spread thinly over the other slice of bread. Place the second slice of bread over the mound of food on the first slice. Eat with great delight. You may need to giggle when you see the size of your sandwich, and the fact that it needs to get into your mouth. Open wide and enjoy! In a medium mixing bowl, combine kale, olive oil, and sea salt. Massage the oil into the kale until shiny and green. Let sit for ten minutes. In a separate (small) bowl or jar, combine apple cider vinegar, maple syrup, and mustard. Mix well to combine, and pour over the marinated kale. Sprinkle hot pepper flakes over top. Eat with joy! It’s delicious AND you’re getting your greens in! This sandwich looks amazing! I love tempeh and avocado! I find the avocado can act like mayo because it’s so smooth and creamy! What do you marinate your tempeh in? I’m always looking for new tempeh recipes. MMMMMMMMMMM,..lovely flavours combos in here! @Maggie — this tempeh I bought pre-marinated. But here, I think it would be great to do a light teriyaki-style marinade with ginger, garlic, tamari, and sesame oil. I’m doing another tempeh post soooooon with an orange juice/chipotle marinade. Yum.